The surrealist global ponzi scheme gallops merrily ahead, as sovereign governments buy each other’s’ worthless fiat debts, sounding false narratives of “growth” and “progress” all the while. This is driven by the fallacy that debt service, and only debt service, matters. But the combination of two forces: titanic amounts of ever-increasing interest and a precipitously falling developed-world birth rate that has population skewing ever-more-heavily toward GDP-non-contributory retirees leaves the world paying through the teeth for artificial current "growth" that it can neither afford nor sustain. 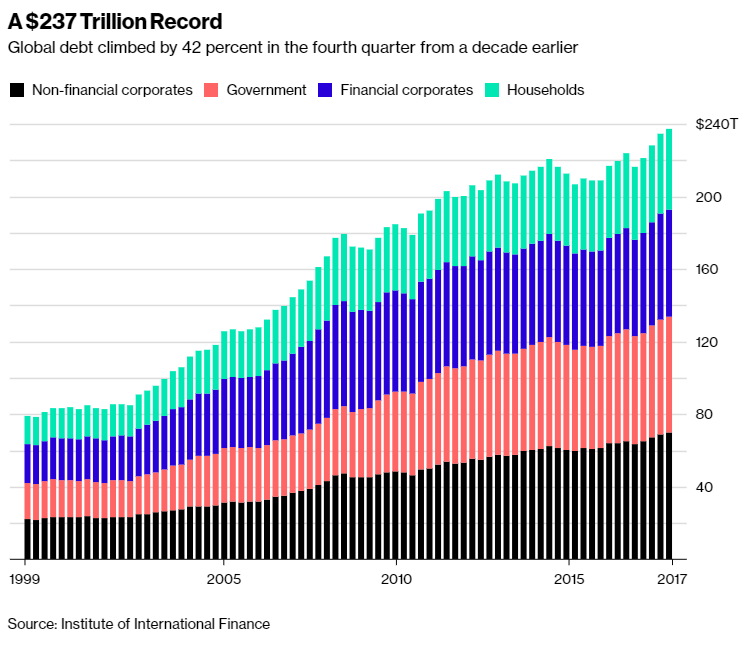 Global debt rose to a record $237 trillion in the fourth quarter of 2017, more than $70 trillion higher from a decade earlier, according to an analysis by the Institute of International Finance. Among mature markets, household debt as a percentage of GDP hit all-time highs in Belgium, Canada, France, Luxembourg, Norway, Sweden and Switzerland. That’s a worrying signal, with interest rates beginning to rise globally. Ireland and Italy are the only major countries where household debt as a percentage of GDP is below 50 percent.